and red being the highest dosage. Now I know what most people think of when they hear the word "shots" correlated with a doctors office, but do not stress! Allergy shots are not just a bunch of huge needles entering and exiting your skin while putting an injection of allergens into your body. They are small needles! I've been getting allergy shots for a few years now and I really do not notice the needles anymore. So I guess one good thing that comes out of allergy shots is that you will not be afraid of needles or really feel the pain as much. 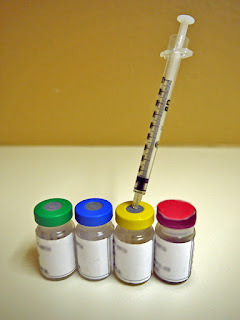 The overview of allergy shots which your doctor or the internet will tell you that they are used to help alleviate symptoms of allergies by exposing your body to allergens that affect your body in small dosages that lead up to larger doses. For me, allergy shots have done exactly that. It took a while to get used to having my arms lined with hives and other issues but once my body started adjusting, I felt much better. Typical symptoms after an injection include redness around the injection site, inflammation, or hives. Most offices recommend the patient to stay for 30 minutes after the injection to ensure the patient is comfortable enough to leave without any major problems. I am allergic to grasses, weeds, pollen, mold, and dust which are pretty much always surrounding me in the environment. After a few weeks of allergy shots, I began to notice that I was not having to deal with a constant runny nose, itchy eyes, or itchy skin even when I took my allergy medicine. While I am aware that most kids do not want to leave their busy day to spend a small amount of time at a doctor's office, especially when shots are involved. However, I am here to tell you that it is the best. Maybe I have a biased opinion on doctor's offices because I love the medical world, but I always enjoyed being behind the waiting room and seeing the nurses working in their normal environment. For many, it may be scary to begin this process and I completely understand because I went through the same process. I was frightened of the unknown and did not want to learn that the shots were painful or did not work properly. As I previously stated, do not stress. New experiences are not always fun but many of them turn out to be amazing experiences. If you are on the edge of deciding to begin treatment, do not hesitate. Allergy shots will make your life easier, less painful, and you will save yourself a lot of tears and time wasted itching your eyes from dry eyes and other symptoms that allergy shots can alleviate in time.